A very pretty intergeneric hybrid tree between Catalpa and Chilopsis (Desert Willow). We really like this small tree that forms an umbrella shaped crown in time. 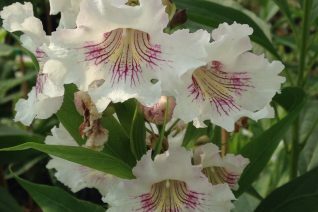 To 20′ tall and continuously producing opulent large white flower clusters- the interior of the flower is marked with purple veining- much like an exotic orchid. The flowers appear on new growth and are continuous from June to September. The long thin tapered light green leaves have a nice texture. They do not color up appreciably in fall- making due with light yellow to off green before abandoning the tree. Excellent garden tree. We prefer the white flowered form as the often planted pink variety …..well, lets just say Portland has a LOT of pink flowering trees. Fast growing in youth-especially if well watered in summer. Otherwise, supremely tolerant of drought as well as rough, hot urban conditions. Casts moderate shade in time. Breaks dormancy late- usually late April. Be patient.